I mean. Can I get a yeah girl? The day I made these drippy little drip cakes was a day full of lessons. Lesson 1: Don’t get greedy with the batter. Stop just over halfway. Don’t you creep to three-fourths! Overfilled cupcake tins make everybody sad. Lesson 2: If your fresh raspberry frosting wants to be thin and loose instead of thick and fluffy, don’t yell at it, alone in your kitchen. It won’t help and it’s embarrassing. New strategy: dub the cupcakes “drip cakes” and the runny frosting will look clever and purposeful! Oh, that? That’s just my genius at work. On purpose. Lesson 3: Nothing tastes better than warm, homemade chocolate ganache. This lesson takes many, many licks to learn proper. I love learning. Lesson 4: Finding streaks of dried cupcake batter on your arm 3 hours later is okay I guess. Baker’s tattoo. Lesson 5: Find someone to take these away from your kitchen and home and general mouth area soon otherwise you are in trouble. 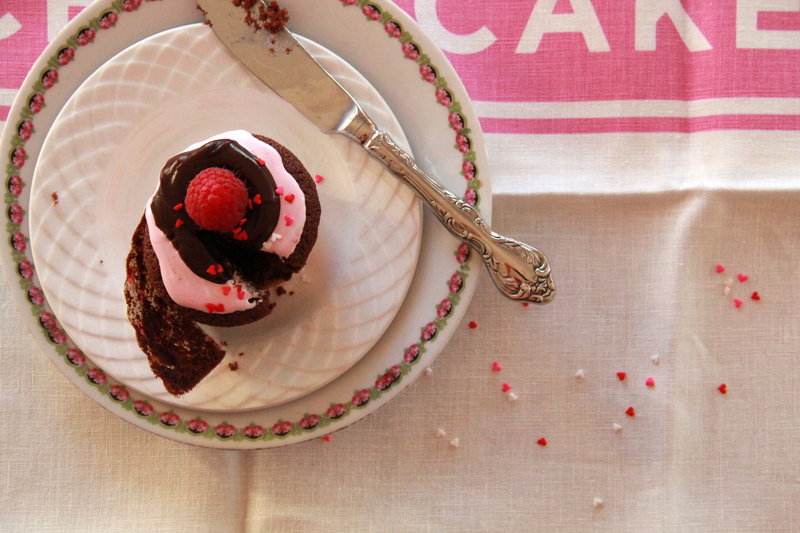 Just a few lessons in life, love and cupcakes (redundant), from my little kitchen to yours. Happy weekend! Heat oven to 350 degrees F. Line muffin tins with paper liners. In a small bowl, whisk together the cocoa powder and hot water until shiny and smooth. Set aside. In a larger bowl, whisk together the flour, baking soda, baking powder and salt. Set aside. In a saucepan set over medium heat, melt together the butter and sugar, stirring to incorporate. Transfer the butter/sugar mixture to the bowl of a standing mixer fitted with the paddle attachment. Beat the butter and sugar on medium-high speed, until it has lightened a bit in color and is no longer warm to the touch. Add the eggs, one at a time, beating well after each addition. Beat in the vanilla. Whisk the buttermilk into the cocoa powder mixture until smooth. Alternate adding the flour and cocoa/buttermilk mixture to the batter, starting and ending with flour, until the batter looks smooth and streak-less. Pour devil’s food batter into the prepared cupcake tins, filling each cup just over halfway full. Bake until a skewer inserted into the middle of the biggest cupcake comes out clean, about 25 minutes. Cool for 15 minutes on a wire rack, then turn out cupcakes onto racks and let cool completely before frosting. 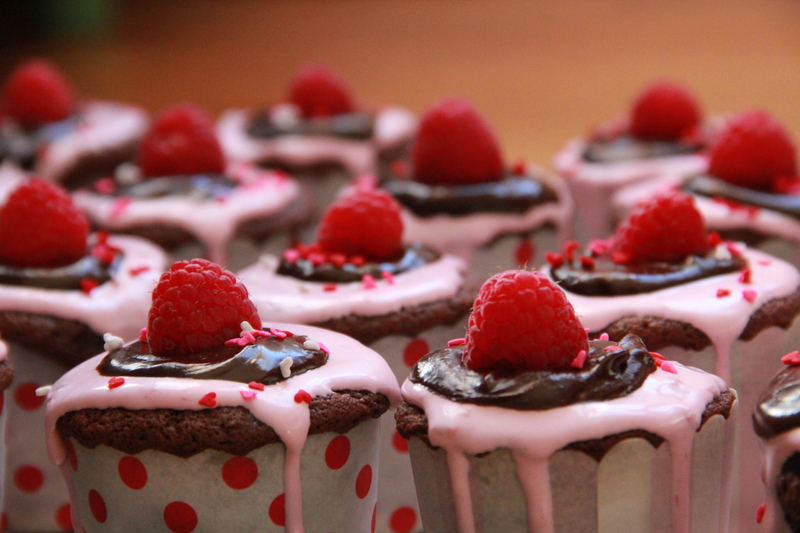 To make raspberry drip frosting, beat together the marshmallow fluff and softened butter. Add the confectioner’s sugar and beat until smooth. Add the raspberries and continue to beat, until berries have broken up and incorporated into the (now pink!) frosting. It will be a bit thin and, as the name implies, drippy. 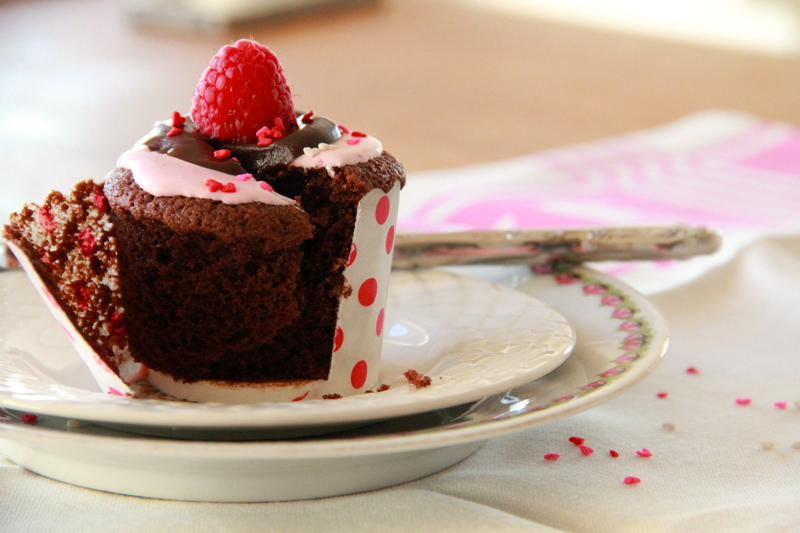 Spread a teaspoon of frosting atop each cooled cupcake, and allow the excess to drip over the sides (make sure to rest the cupcakes on a sheet pan or piece of parchment paper to catch the drips). 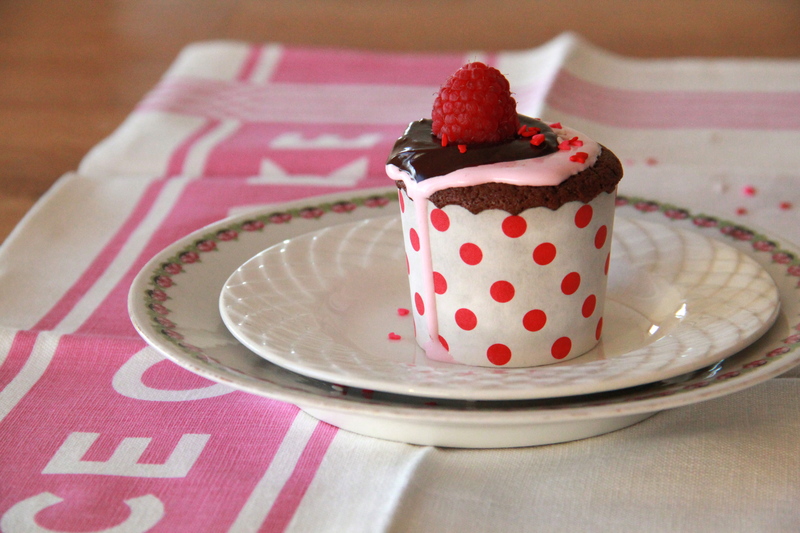 While raspberry frosting sets up a bit, make the ganache: place the chocolate chips into a medium bowl. Heat the heavy cream in a small saucepan over medium heat, just until it starts to gently steam and simmer at the edges. Immediately pour the hot cream over the chocolate chips, making sure to cover them all. Allow the chocolate to sit in the hot cream for a full minute before using a whisk to stir together the ganache – it should be shiny and smooth. Let the ganache sit for a few minutes to firm up slightly before dolloping drops of smooth ganache on top of the raspberry drip frosting. 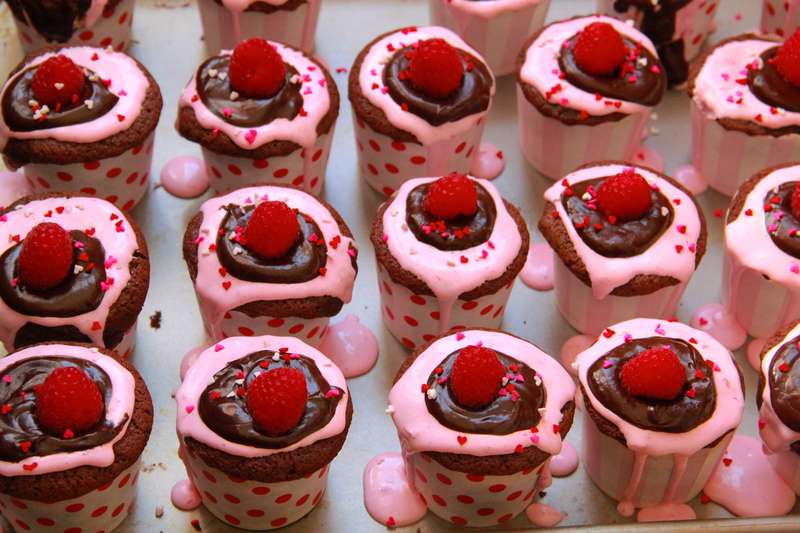 Top each cupcake with a fresh raspberry and some sprinkles, if you like. These are best eaten on the day they’re made, but will last 2-3 days wrapped airtight in the refrigerator. Oh, hey, I love that drippy frosting! So clever and purposeful! So cute! I hear you with the baker tattoos. Im a disaster in the kitchen. Often they appear as highlights in my hair. Awesome- especially when you go to class like that. Ahhh…. I figured from the name. I’m like, what’s a drip cake? I get it now. I sometimes change names of food to fit my kitchen misadventures. 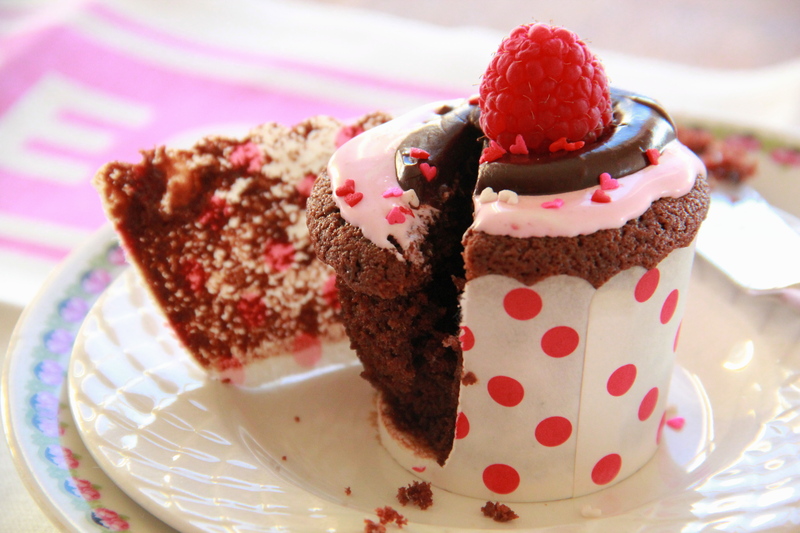 haha… This is a cupcake recipe I’ll be doing very soon. Hey! I’m excited to make these but I do have one question. At which point do add the cocoa powder and water mixture?? I read the directions several times but don’t see it. Thank you! Oops – good catch, Kimberly! The cocoa powder/water mixture gets whisked with the buttermilk and then that mixture gets added to the batter alternately with the flour — I’ve updated the recipe, above. Thanks, and hope you enjoy!